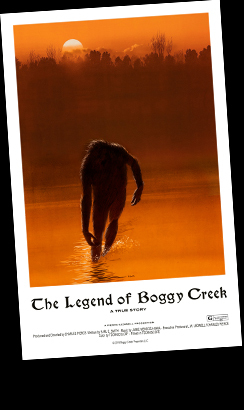 Welcome to the official website of the 1972 cult-classic film, The Legend of Boggy Creek. The Legend of Boggy Creek was conceived and directed by Arkansas native, Charles B. Pierce. The movie was released independently in 1972, where it initially played in sold-out theaters in the Arkansas and Louisiana areas. In 1973, it was picked up by the film distributor Howco International, who made it widely available in theaters across the country. The Legend of Boggy Creek, which cost around $160k to make, became extremely popular in the 1970s, playing for many years in theaters, drive-ins, and later on television. It made an estimated $25 million dollars by the end of its run. The movie was inspired by true events that happened in the small town of Fouke, Arkansas. When people there began reporting sightings of an agressive sasqsuatch-like creature known as the "Fouke Monster," it caught the attention of Charles B. Pierce who turned it into a successful film that is still remembered to this day. » The film is currently being restored using 4K scan technology for re-release next year. Stay tuned for more details! » Be the first to see the restored, remastered THE LEGEND OF BOGGY CREEK film at the historic Perot Theater in Texarkana on June 14-15. For tickets and information, click here. To have the latest Legend of Boggy Creek news delivered to your inbox, click here.